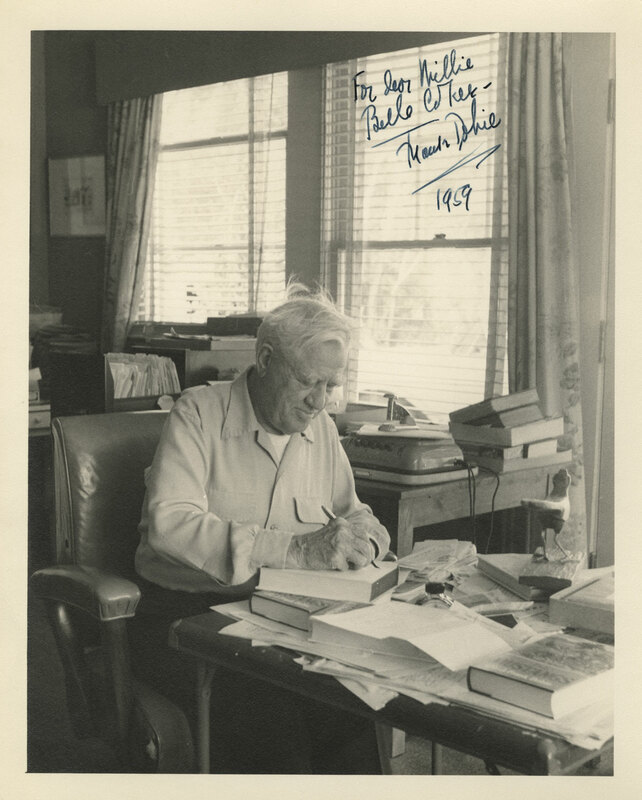 The Ransom Center is currently engaged in a one-year, grant-funded project to digitize, catalog, process and make the Frank Reaugh art collection available online, which will be the first complete collection of the Ransom Center’s new digital asset management system. The project is ongoing and is expected to be completed and available online to viewers by the fall. The Frank Reaugh collection consists primarily of pastel landscapes on paper and board but also includes oil landscapes and portraits, charcoal sketches, and pen and ink drawings. 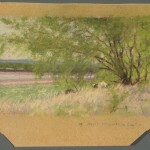 Reaugh’s (1883–1937) favorite subject, the Texas Longhorn, is often featured within his untamed Texas landscapes. His work includes native subjects and locations ranging from the Texas Panhandle to the state’s western plains and mountainous regions and beyond the state border to New Mexico, Arizona, and Wyoming. Interest in Frank Reaugh has grown steadily over the years, as his contributions as an influential artist, arts educator, benefactor, naturalist, and inventor are being increasingly recognized by curators, collectors, and scholars. Access to the works has long been limited due to their delicate nature and to their sheer number and size. Digitization of the framed and often fragile works is not simple. Many of the pastels have never before been removed from their original frames and mats, which were largely constructed by Reaugh himself. 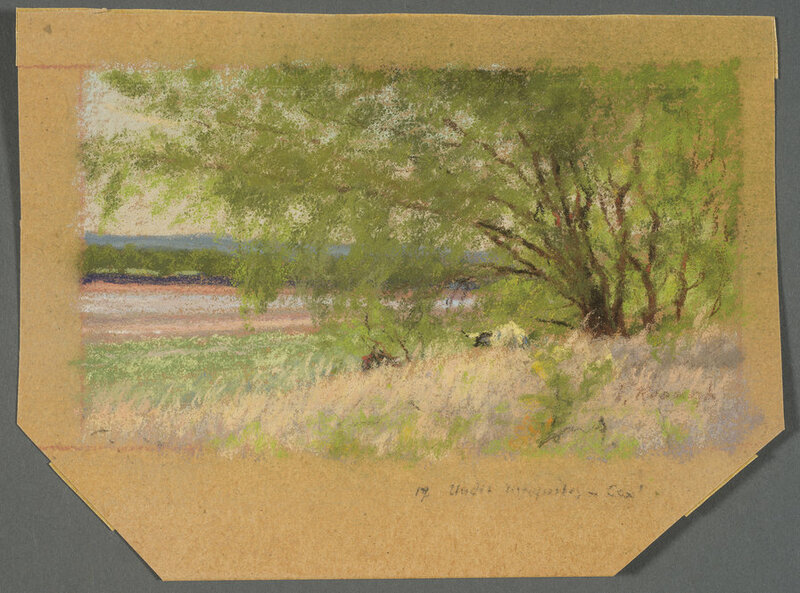 Thus far, the first half of the collection has been digitized, beginning with Reaugh’s distinctive small-format pastel landscapes. 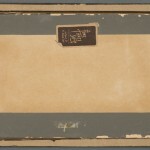 When the project is finished, researchers will not only have unprecedented access to the entire body of Reaugh’s work held by the Ransom Center but will also have the opportunity to peer beneath the frames. During the process of removing these delicate pastels from their frames, there is often an unexpected surprise waiting beneath the window mat. Reaugh used his own technique to prepare the paper to hold the pastel media, and evidence of this applied fixative is easily visible in the margins of the paper support. 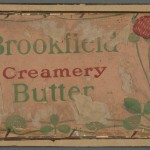 A view of the margins of some of these pastels also reveals previously hidden inscriptions and areas where Reaugh tested his colors. One can see the well-delineated borders of his rectangular landscapes, which he sometimes stayed within, but more often allowed his strokes to extend beyond the intended space. 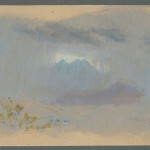 Two pastels have even revealed outlined sketches on the reverse, offering insight into Reaugh’s preliminary drawing techniques. 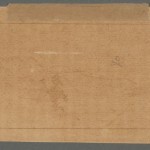 In addition to the works themselves, the framing materials and methods speak to Reaugh’s time on the cattle-trail, where it appears that he made use of whatever materials he had on hand. 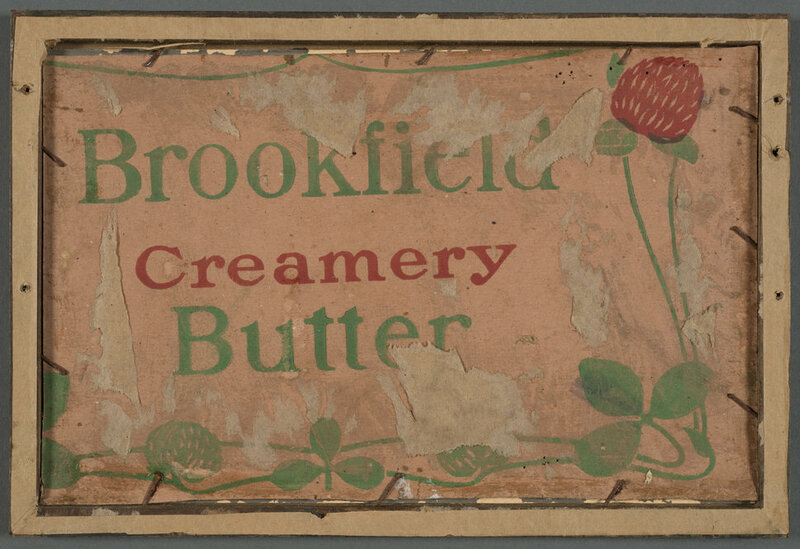 Images of each artwork (including the fronts and backs, framed and unframed) will be available via the Ransom Center’s new digital asset management system in the fall. Funding for the Frank Reaugh project is made possible with support from the Institute of Museum and Library Services and the Texas State Library and Archives Commission. 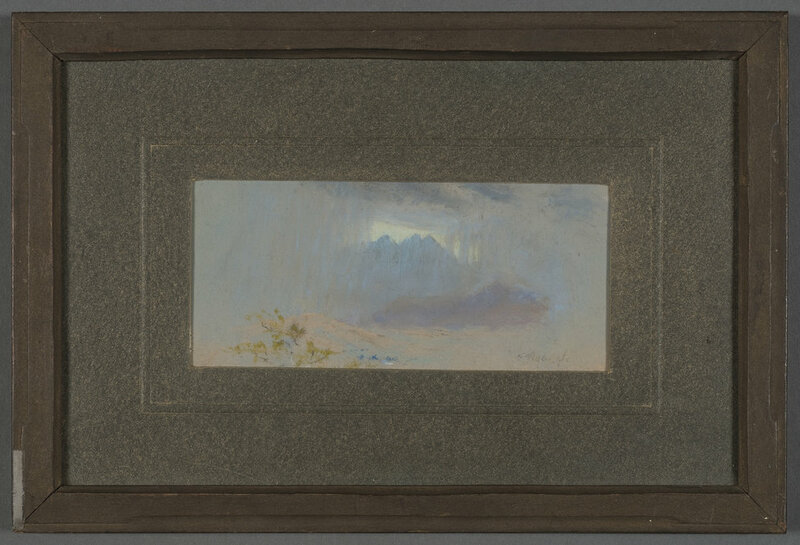 “Rift in the Rain Cloud” by Frank Reaugh (1860-1945), front of framed work. Photo by Pete Smith. 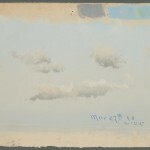 “Rift in the Rain Cloud” by Frank Reaugh (1860-1945), back of framed work. Photo by Pete Smith. 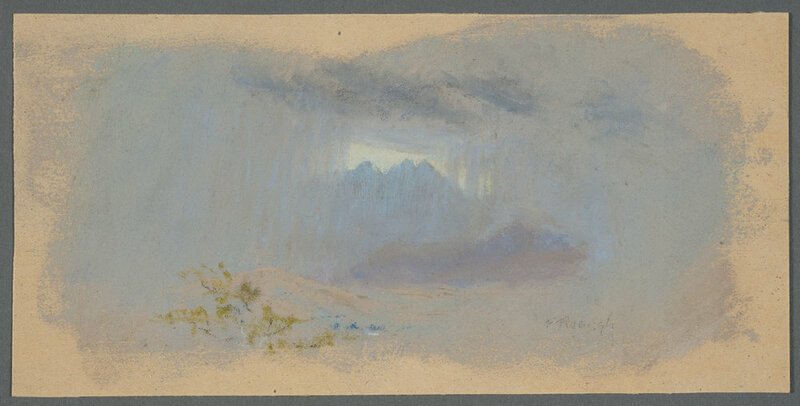 “Rift in the Rain Cloud” by Frank Reaugh (1860-1945), front of pastel. Photo by Pete Smith. 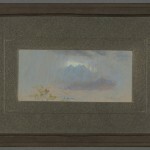 Untitled [light pink with hills] by Frank Reaugh (1860-1945), verso, showing sketch of a landscape. Photo by Pete Smith. 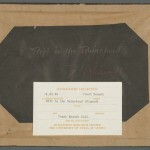 “Rift in the Rain Cloud” by Frank Reaugh (1860-1945), showing uncovered backing board. Photo by Pete Smith. 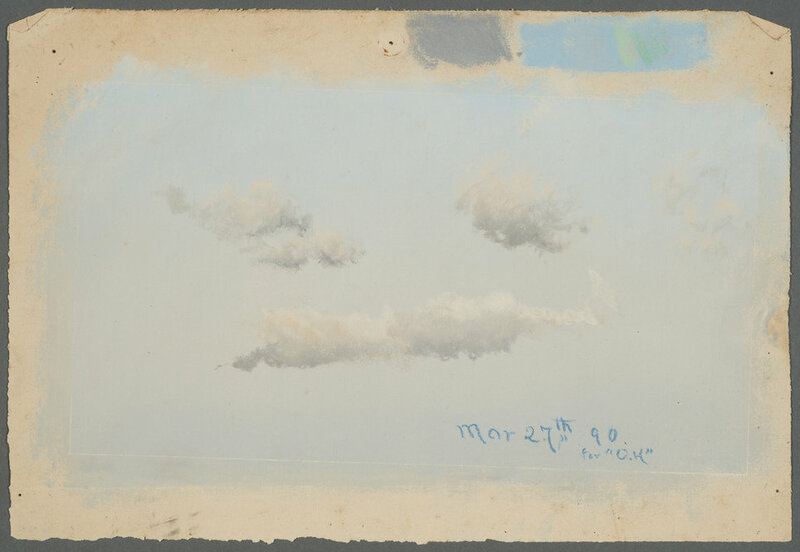 “Clouds for OH” by Frank Reaugh (1860-1945), showing swatches of color in the top margin. Photo by Pete Smith. 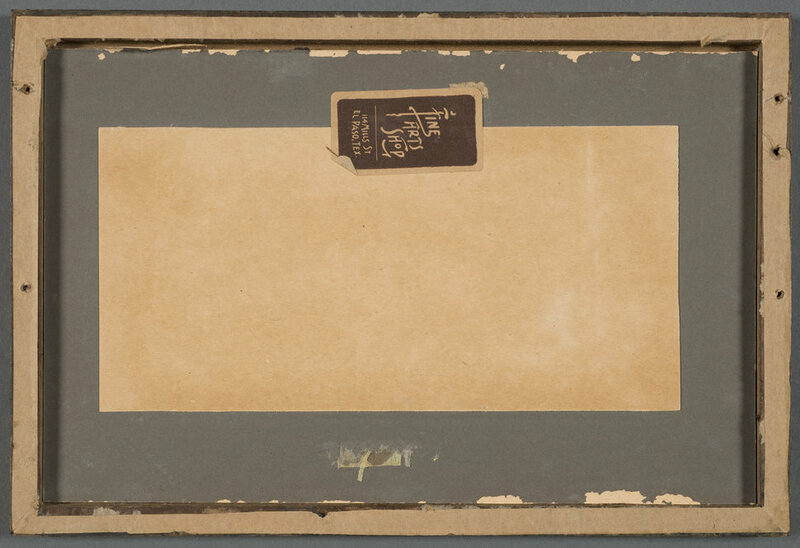 “Under Mesquites” by Frank Reaugh (1860-1945), showing an inscription in the margin. Photo by Pete Smith.